Acupuncture is becoming increasingly popular among sufferers of all types of headaches, both acute and chronic – as well as debilitating migranes. The effectiveness of acupuncture in relieving head pain also is becoming increasingly supported by clinical studies in the United States and other Western countries. As far back as 2008, Duke University issued a press release stating, “Acupuncture is more effective than medication in reducing the severity and frequency of chronic headaches.” Duke University’s own Duke Integrative Medicine facility in Durham, NC, offers acupuncture as an important component of its treatment options. Acupuncture has also been recommended as a viable treatment for chronic headaches by the National Institutes of Health, attributing it with reducing the incidence and severity of tension headaches and possible prevention of migraines. A recent study conducted in Australia concluded that acupuncture is as good as prescription medication for a wide range of pain – including migraines. In another report, the Journal of the American Medical Association (JAMA) published an analysis of an acupuncture study involving 249 participants who regularly suffered migraines. They were divided into three groups: those receiving acupuncture, those receiving “sham” acupuncture and a control group receiving no treatment. Over a 24-week period, those who received true acupuncture treatment revealed a significant change in the frequency of migraines, indicating long-term pain relief. Because “headache” is a general term, it is helpful for the purposes of diagnosis and treatment to identify the categories into which this type of pain can be classified according to symptoms. About 90% of all headaches fall into this category. They may alleviate after a few hours, or occur more frequently and last all day. Tension headaches occurring more frequently and lasting longer are known as frequent episodic tension headaches. An even more severe form is the chronic tension headache. This type of headache presents as a burning sensation around and above the eyes, at the temples and toward the back of the head. Other symptoms may include red, swollen eyes or a runny nose. Migraines are typically characterized by pulsing or throbbing pain on one side of the head, photophobia (extreme sensitivity to light), nausea, vomiting and/or worsening of pain triggered by physical activity. The sufferer may experience an “aura” – a series of sensory and visual changes that occur just before an episode. Migraine headaches are often misidentified in self-diagnosis as a sinus headache. Migraines are more common in people under 55 years old. According to the American Migraine Foundation, sufferer demographics consist of one in five women, one in 16 men and one in 11 children. The exact cause is not known, but some common triggers include stress, allergies, hormonal changes, caffeine withdrawal or overload, bright lights, lack of sleep, skipping meals, weather changes, alcohol (especially red wine) and foods containing nitrates. As people become more cautious about seeking pain relief from prescription medications, acupuncture provides treatment that has been part of Traditional Chinese Medicine (TCM) practice for more than 3,000 years. A review article in Practical Pain Management found that pain relief with acupuncture comes from inactivating the source of pain by modulating endorphin levels. In another study, acupuncture was shown to also stimulate the production of another natural painkilling chemical compound called adenosine. By releasing these powerful biological chemicals through acupuncture, the body goes to work on healing itself. 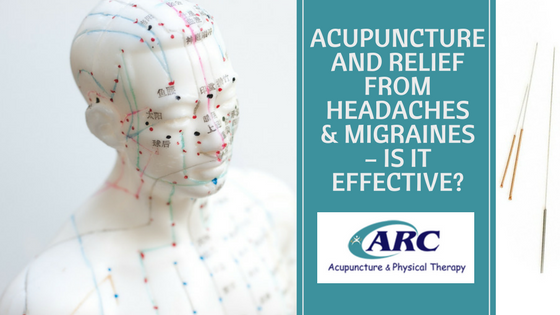 Finding an experienced acupuncturist is an essential first step in determining the type of headache to be treated and an appropriate treatment plan. Our team at ARC Acupuncture & Physical Therapy have helped many people relieve or eliminate pain and enjoy a better quality of life. We invite you to learn more and contact us to schedule a consultation at one of our six Central Florida ARC Acupuncture & Physical Therapy locations.